My youngest, like so many other kids out there, is obsessed with Minecraft! This year we went a little overboard and built our two boys gaming computers. They love to play and would do so from morning until night if we allowed it. So this year we decided Christmas and Birthdays are going to be minimal. I have been looking through patterns, scouring through Tumblr and Pinterest and I finally figured out what I am going to make for the youngest. I have decided to create a Personalized Minecraft Graphghan! 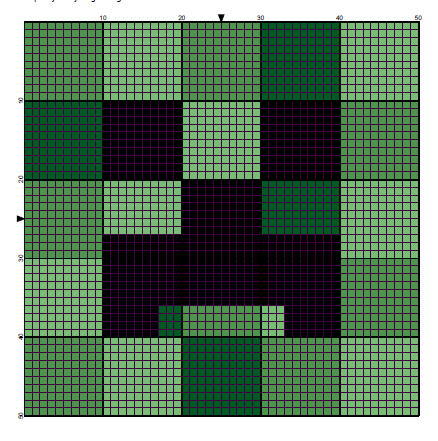 Problem one….I had no clue what character to pick, so I picked a few and I have decided to graph them all out, hook them up individually and share them with all of you as I create this fun piece for my Minecraft addict. This is the beginning of my Minecraft journey, the O so very loved Creeper. He has been known to wear many colors of green at one time or settle for just one. Either way he is easily picked out of a lineup by any parent of younger and older children alike. My square was done in a single crochet with an I hook and Red Heart Super Saver yarn in Thyme, Light Sage and Hunter Green. I prefer to do my graphs in single crochet but you can do them in many other stitches. You can do them in half double crochet, tunisian and even in a corner to corner. You can see my latest c2c here and get some tips as well as see my how to c2c graph video on Youtube. This guy ended up measuring 15″ square, but you can adjust your size with the hook you choose to use. I currently have another 5 graphs created for this but I plan to work on a few more so that this turns out to be a good size throw. If you have any questions on anything that I have said or I have forgotten please ask. Please feel free to hook or knit this guy up and share your images with me here in the comments or on Facebook or Instagram. I would love to see everyone’s progress on this afghan as I share mine with all of you. This entry was posted in crochet, diy, patterns, tutorials and tagged Crafty Ridge, crochet, crochet graphs, minecraft, tutorial. Bookmark the permalink. How impressive it is! How to make it? Reblogged this on Chicago Fandom. It looks awesome! I’m sure your youngest would love this X-mas present. Thank you, I think he’s going to love it too! Is it just based on Minecraft block? Which material I need to make the one for my sweetheart? I think he will be surely amazed! It is based purely on Minecraft. I am using worsted weight yarn an I hook and some yarn bobbins. Love this! Have just started on a granny square version of one! I just stumbled across this and I love it! I am going to try this! 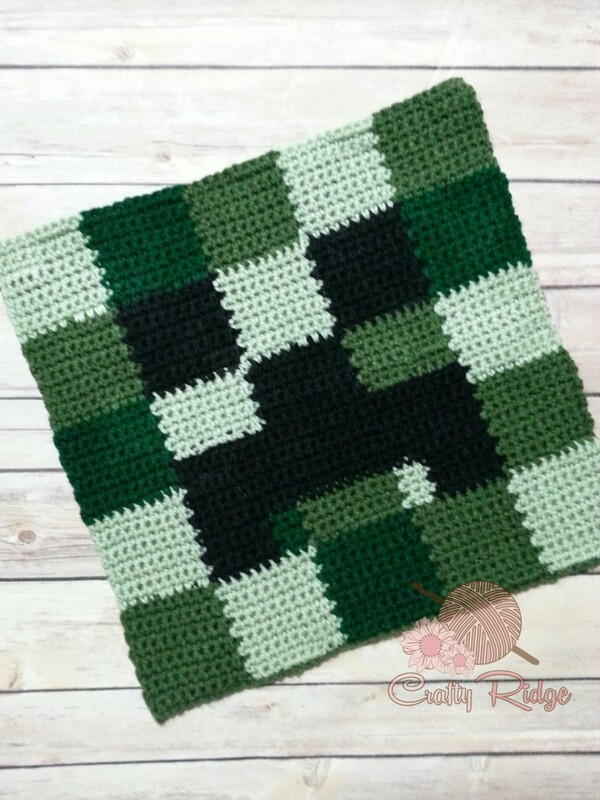 Check it this awesome CAL for a Minecraft afghan! I’m a little late, but I WILL catch up! Thank you to Crafty Ridge Designs for putting together such a fun project! I am so glad I stumbled on this, one of my grandsons is obsessed with mine craft, I quickly looked thru this and saw the characters. I have been looking for something to crochet with his favorite character, I believe it is Ghasty. (At least that is what I think he is saying!) Do you also have a panel with this character? Could someone help me with graphing my grandson’s name? It is only 5 letters and I would not need the shading. My “squares” are coming out very rectangular — for instance my creeper is 16″ wide by 13″ high, even though it’s 50 rows by 50 rows. Any suggestions? It’s due to tension. Sometimes our stitches aren’t as high as they are wide. The best way to fix that is to block the finished square. This will help it get to the size you want and stay there after washing. See my post about Blocking Flat Pieces for details on how to block them with steam. Thanks for the reply! I was worried that a 3″ difference was too much to overcome with blocking, especially on a synthetic yarn. I’m debating blocking before I put on the black edge to see if I can get it a little more square first…but I’m not sure which is best. I block the squares. Then I block the finished blanket. So the entire piece is shaped exactly how I want it.